It is the policy of Environmental Products & Services of Vermont, Inc. (EPS) to conduct all operations in a manner that is environmentally responsible not only to the benefit of the company but also as a good corporate steward, neighbor and citizen. 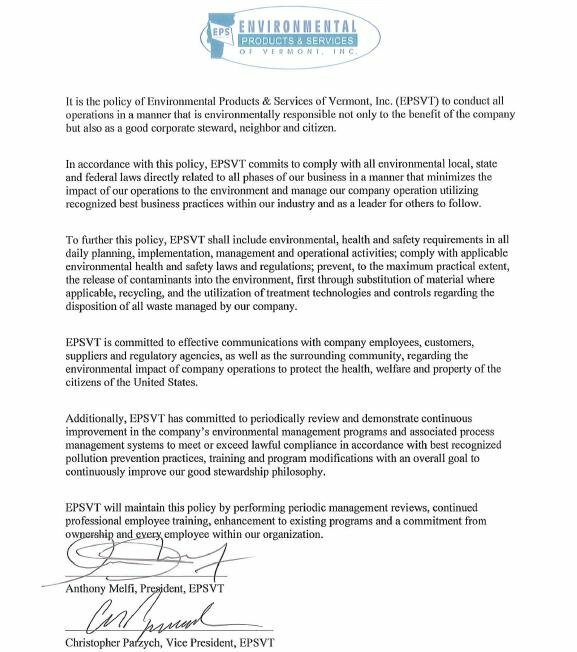 In accordance with this policy, EPS commits to comply with all environmental local, state and federal laws directly related to all phases of our business in a manner that minimizes the impact of our operations to the environment and manage our company operation utilizing recognized best business practices within our industry and as a leader for others to follow. To further this policy, EPS shall include environmental, health and safety requirements in all daily planning, implementation, management and operational activities; comply with applicable environmental health and safety laws and regulations; prevent, to the maximum practical extent, the release of contaminants into the environment, first through substitution of material where applicable, recycling, and the utilization of treatment technologies and controls regarding the disposition of all waste managed by our company. EPS is committed to effective communications with company employees, customers, suppliers and regulatory agencies, as well as the surrounding community, regarding the environmental impact of company operations to protect the health, welfare and property of the citizens of the United States. Additionally, EPS has committed to periodically review and demonstrate continuous improvement in the company's environmental management programs and associated process management systems to meet or exceed lawful compliance in accordance with best recognized pollution prevention practices, training and program modifications with an overall goal to continuously improve our good stewardship philosophy. EPS will maintain this policy by performing periodic management reviews, continued professional employee training, enhancement to existing programs and a commitment from ownership and every employee within our organization. ENVIRONMENTAL PRODUCTS & SERVICES OF VERMONT, INC.